This Irish plaque is a matted shadow box that houses a dimensional shamrock sprig under glass. The wooden shamrock shadow box measures 7 1/2" x 7 1/2" x 1 1/4" deep and it is ready to hang on your wall. 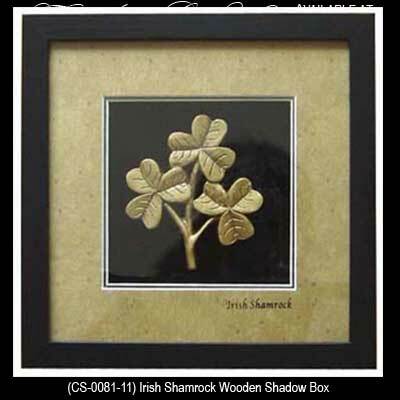 The Irish wall hanging is made in Ireland by Celtic Shadows and it is packaged with a shamrock history card that is complements of The Irish Gift House.